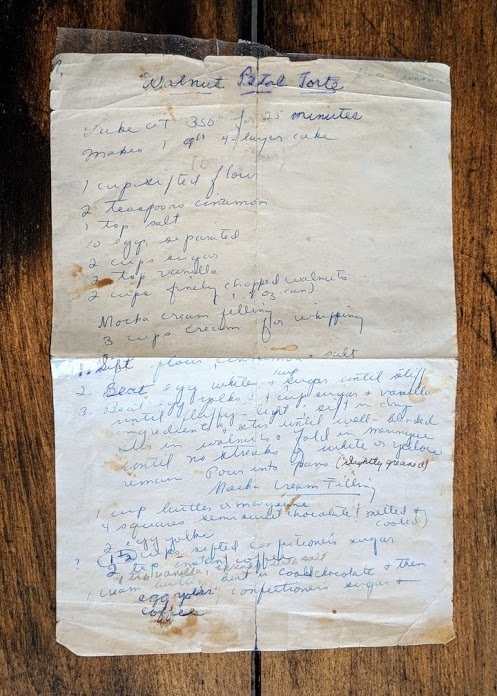 How many of you have cherished family recipes that look like this? Don’t we all have these recipes? The ones made for us by the people who loved us most? These foods carry our most precious memories. We make them again and again. Not only because we love the recipe but also to honor the life of the person who made us that food. This is exactly why I’m sharing my grandmother’s Walnut Petal Torte Cake. Every Christmas, my grandmother (on my Father’s side) made this delicious cake. With it’s light fluffy, walnut-filled crumb, a creamy mocha filling between each layer and whipped cream icing, this cake looks stunning and tastes even better. As my regular reader’s know, I have already written about my grandmother on my Mother’s side and how much her example has taught me. But I’ve said much less about my other Grandma; in part because that story is harder. Or at least more complicated. To contrast my Mother’s and Father’s upbringings - my mother was raised in a big Amish Mennonite family, on a 700-acre dairy farm, surrounded by siblings and rich tradition. Life was tough but it was also structured and - most importantly - secure. My father and his brother, on the other hand, were raised by a single mom. Their father left the family when my father was about 2. After my grandfather left, he played no significant role in the 2 boys’ upbringing. This was the 1940’s and divorce equaled social ostracism. Worse yet, divorce equaled poverty. Or at least it did for Grandma. Growing up I heard the stories. Like how the neighbors told my grandmother she was sinning because she mowed her lawn on Sunday. (Alright neighbors, get over your sanctimonious selves. Grandma worked 6 days a week. Sunday was her only day off. When else should she mow her lawn??? Hrmph!). Or how people delighted in telling her that - because her husband left the family - her sons would be total failures. (To the haters - you excelled at judginess but are apparently lousy at predicting the future. My dad graduated from Cornell. And my Uncle started a family business that still successfully operates today). Like, how they lived in such sub-standard rental housing that my grandmother was once bitten by a rat while sleeping. These stories paint a tough picture but that’s not how I internalized them as a child. You see, by the time I came along, Grandma’s life looked anything but tough. The Grandma I knew was financially secure. Even though she did not come from privilege she was whip smart and painstakingly built a successful career. Then, later in life she married my step-grandfather, a brilliant and stable man who had means of his own. They now lived in an immaculately clean, perfectly organized cottage they built overlooking Lake Ontario. Even Grandma’s her vegetable garden sparkled - perfectly straight rows, no weeds, ringed with flowers. It was a beautiful, warm and peaceful place. I felt so loved there. She became a leader in the church, organizing almost all of the church dinners. And at home, she was an adventurous, stylish cook, making family dinners that included things like hollandaise sauce. (Seriously, has anyone else ever bothered making their own hollandaise sauce? Personally, I go to brunch just so I don’t have to). No matter what she did, she took the time to make sure every detail worked. There were no judgy neighbors. There were no rats. Until I couldn’t dismiss them anymore. Because as we grow older we experience just how difficult life can be. We understand pain is real and that deep pains never leave us. Even after things start looking better. Slowly, I started to see Grandma’s carefully curated life with more nuance. I now imagine Grandma experienced incredible fear that she would never be able to make things right for her sons. I imagine she probably felt broken. And that the broken feeling probably never entirely left her. Did she make her surroundings lovely to help heal the pain from when things were very much not lovely? (Actually, Grandma was fiercely loving and non-petty and would never have done that. That’s actually what I would do. All over Instagram). Her lived experience probably embodied pain, exhaustion, relief and triumph all at the same time. I now see that to ignore any of these possibilities is to diminish Grandma’s invincible, brave life. So folks, to honor my grandma's entire story, here is Grandma’s Walnut Petal Torte recipe. It’s a complex and beautiful cake that embodies a complex and beautiful life. Now I want to hear about the tattered recipes that hold your family memories. Who are you remembering this holiday? What is their legacy in your life? Will some of the foods you inherited from them be on your holiday table? The cake is singularly delicious and worth the effort but - if you decide to make it, set aside at least 6-8 hours to make and assemble it. - Once cakes are cool, you will need to use a spatula to remove the cakes from the pan. Work slowly around the edges of the cake, making sure to work the spatula underneath the cake so that the cake can be gently lifted. - Flip the cake pans to remove the cake. Using a mixer, whip 3 cups whipping cream, 3-4 TBSP powdered sugar and 1 1/2 tsp vanilla. Plop the Icing on the top of the cake and call it done. That is what I do. I mean, I love this cake but I can’t spend my entire life on it! - Using the back of a spoon, make “petals” of cream as pictured below. On the left-hand side you can see the cake with unfrosted sides. This is how I serve it. On the right-hand side, you can see what my grandmother used to do. 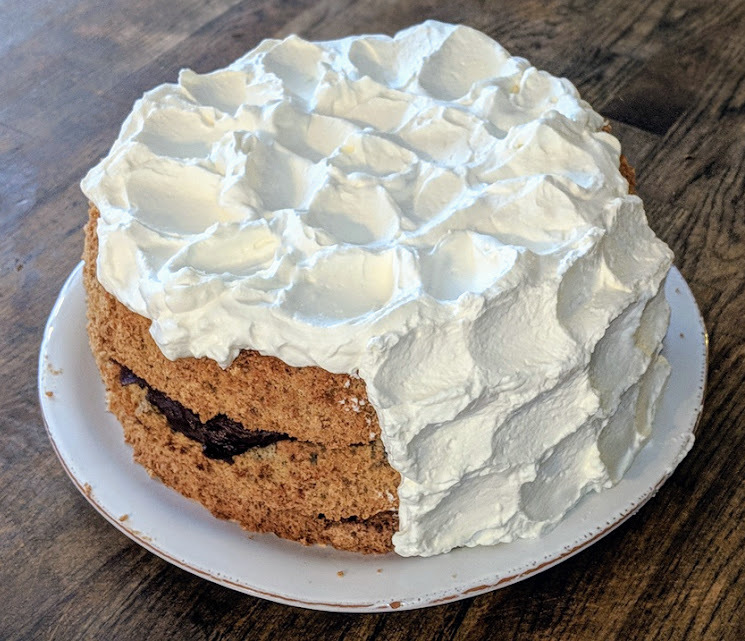 She continued the whipped cream and the petalling all the way down the side of the cake. If you’re crazy enough to make this cake, do let us know how it turns out! !